As discussed earlier (see post), crude oil (particularly WTI) remains under pressure. 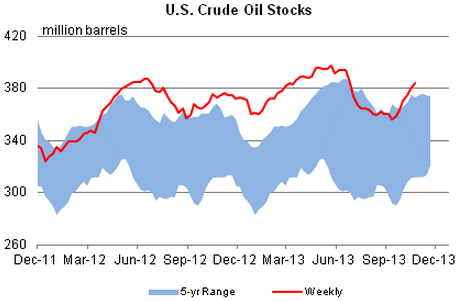 As US economic activity slowed (see post), so did the demand for crude. This pushed up inventories to 5-year highs for this time of year. The rise in crude inventories can be explained by the fact that US oil production is now 15% higher than it was a year ago, while refinery demand has declined to levels that are similar to last year's. 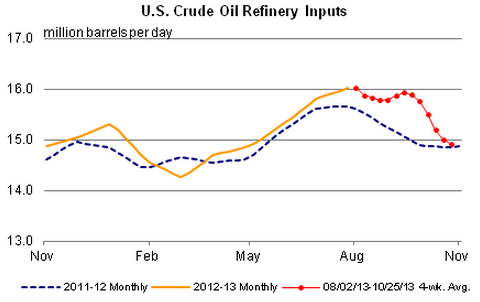 One can see the impact of the government shutdown in the chart below, as refineries cut production. Moreover, with the Fed's "taper" looming and the dollar seemingly stable, traders have sent crude prices lower. The weakness in the energy complex has spread to other sectors, pressuring the overall global commodity indices. For example, the CRB BLS Index (described here) is at this year's lows. And the DJ UBS Commodities Index is now at the lowest point since the summer of 2010. While energy remains the largest factor pushing commodity indices lower, demand weakness combined with strong production seems to be pressuring a number of other commodities sectors as well. Bloomberg: - West Texas Intermediate fell below $95 a barrel for the first time since June. Gold reached a two-week low. Hog futures capped the longest slump in three months, and cotton slumped to the lowest since January. Production is poised to top demand for everything from coffee to zinc as ample rains this year boosted global crops and demand waned for metals, grains and energy. U.S. crude inventories climbed to the highest since June, data from the Energy Information Administration showed Oct. 30. Commodity returns will be “mostly flat” in the next 12 months, and there are “significant downside opportunities” in gold, copper and soybeans, Goldman Sachs Group Inc. said Oct. 18. Finally, adding to the softer valuations are some major commodities trading businesses going up for sale. CNBC: - Facing lingering questions about the oversight and profitability of their businesses, Morgan Stanley and JPMorgan Chase have taken steps to sell their commodity divisions, say people familiar with the matter. The firms are holding discussions with a range of offshore buyers who wouldn't be subject to relatively stringent U.S. banking rules.